“Round Ambleside you will indeed find hills and waterfalls – decked with greasy sandwich papers and porter bottles, and the hills echo with the whistles of the Windermere steamers . . . brass bands play under your hotel windows, char-a-bancs, wagonettes and breaks of all colours rattle about with cargoes of tourists who have been `doing` some favourite round. Touts pester you in the streets and in the hotel coffee room you overhear a gentleman ask angrily “Why don`t they build an `ut on `elvellyn – they`ve got one on Snowdon.”. Dickens also made some rude comments about the apparently excessive drinking habits of the local people. The only thing that has changed is that there are more locals now. One theory is that this drinking is stress related, brought on by constant territorial invasion by tourists. A popular misconception is that Ambleside has a solely rural past. It was in fact highly industrialised, involved heavily in the production of charcoal, used in smelting the iron ore of Furness and west Cumbria, then timber for the production of bobbins for the textile industry. It adopted water power at an early stage and later developed machine tool manufacture. Quarrying and mining were local industries, and quarrying continues to be, despite attempts by conservationists to stop it, an interesting case of blinkered thinking – we are forced to use local slate and stone for building. .The Ambleside Oral History Group has been recording interviews with local people since 1978, with memories of life as far back as 1885. The digital archive of interview transcripts is available and searchable online and a series of articles based on these, entitled ‘The Way We Were’ is also available. Here are a few pictures of old Ambleside, which despite the pressures remains a most desirable place in which to live and work, with a fascinating past and present where the diversity, perversity, kindness, generosity and humour of its people never ceases to delight and amaze. Prior to the ice age, which ended here about 10,000 years ago and which sculpted the geological mass of the Lake District into the shapely mountains and valleys whose beauty we admire today, we have no trace of mankind in this area. As the ice retreated, the tree line in the Lake District grew to as high as 2500 feet, which means that only the top 500 feet of our highest mountains would have been visible as we see them now. From then on, there is abundant evidence of the activities of Neolithic man, who can be assumed to have moved here as the warming progressed. The climate became warmer than it is today, allowing the human population to live quite comfortably in the forests. axe factory high among the Langdale Pikes, dating from 4000 BC, it is clear that stone tool manufacture was a major industry with a thriving export market, tools from Langdale having been found at sites throughout Britain and Ireland. The axes produced were highly efficient, suitable for tree felling and killing animals.Techniques of agriculture and stock raising developed as communities, increasingly based on single industrial locations, grew and population rose. Mining was begun in the area, with copper being an early discovery, to lead eventually to the discovery of ores and the iron age. Pottery too developed at this time.Alongside this industrial evidence, there are the mysterious cultural remains of the Neolithic stone circles, later to be used also by Bronze age people for still obscure rituals. Whilst all this evolution was undoubtedly happening in and around the place we know today as Ambleside, it was not until the first century AD that we have archaeological evidence of man in the immediate vicinity. This is provided by the Roman remains, a fort and settlement in the meadows at the head of Lake Windermere which we now call Waterhead. Here there are extensive remains of the fort, its first version being built in about 90 AD, later to be extended by Hadrian. In various excavations many artifacts have been found in the surrounding fields. The Armitt Museum has much information on this Roman site. Galava had road links to Hardknott fort in Eskdale and thence to the major Roman port at Ravenglass on the west coast. From Galava a road also ran northwards, via Troutbeck and over the fell known as High Street, towards the farthest outpost of the Empire, Hadrian’s Wall. The Romans were here until the gradual decline of their Empire. Some time between 300 and 400 AD they left England, though by that time only high ranking military staff and administrators would have been native Romans. What was left behind and what ensued when the rule of Rome collapsed we can only imagine. The Dark and Middle Ages saw fragmentation of territories and the division of Britain into warring tribal kingdoms, with the Church remaining and developing as the one unifying element, the monasteries becoming centres of ecclesiastical and economic power. The territory which includes Ambleside came under the control of Furness Abbey, near modern Barrow-in-Furness, and gradually under skilled management large scale industrial expansion took place alongside the introduction of hardy sheep to the Lakeland fells, these being the only stock able to survive on the higher ground. Hundreds of small foundries were built to smelt the abundant supplies of iron ore, fuelled by the equally abundant charcoal from the dense woodland. By 1000 AD the area enjoyed considerable prosperity, with farming an important component. It was at this time that the fellside grazing land began to be controlled with the boundary dry stone walls which are such a distinctive feature of the landscape today. This period had also seen the coming of the Norsemen, who clearly dominated the area, giving names to places and natural features, names which are still used today. Gradually they integrated with the indigenous population. To what extent their brutal invasion methods initially affected local people here is not known. Their use of high summer pastures in their native lands was introduced here and what we know today as intake (cleared grazing land on the lower slopes of the fells) was probably Viking in its beginnings. 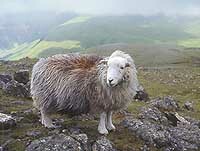 The famous Herdwick breed of Lake District sheep is said to have been introduced by Vikings. It is held by local historians that the name ‘Ambleside’ derives from a Viking named Hamel who owned land here known as his ‘saetre’, a Norse word for farm or pasture. Amid the territorial chaos following Viking invasion and rule, there were battles among warring ‘kings’. One famous site is at the top of Dunmail Raise on the main road north of Grasmere. This was the scene of a bloody battle in 945 AD for control of Cumbria between King Dunmail, the last King of Cumbria, against the united forces of Malcolm, the King of Scotland and Edmund, a Saxon King. Dunmail was defeated and slain there according to some accounts, while Cumbria was given to the Scots. During the next 900 years, Ambleside and its surroundings grew as an industrial centre, but remained distant and inaccessible to the rest of Britain. In relative isolation, it avoided much of the Scottish raiding during the border wars and there is no record of plagues. The ‘old’ town of Ambleside, on the hill surrounding St Anne’s Church (now apartments) was built after the Romans left, using some stone taken from the Roman fort at Galava. Gradually the town extended during the 6th and 7th centuries into the area below Stock Beck which has become the centre today. Mining activity expanded. Expert miners came from Germany and Wales in Elizabethan times to help exploit the rich copper veins at Coniston, thus the local people learned new skills. Copper was found in large amounts, also lead, though the larger deposits were not in the immediate area of Ambleside. Slate quarrying, which had always supplied local building needs, became a major export industry, while farming sustained a population almost self-sufficient in food production, though diet was not very diverse. In addition to sheep, cattle and pigs, oats and barley were grown and a variety of wild plants eaten. Other cereals and vegetables did not grow well in the poor soil of the wet and stony valleys, aggravated by long winters and short summers. The dissolution of the monasteries by Henry VIII led to major changes in local land ownership and tenure, with most of it divided into small farms by 1550, owned or rented by local people. A market charter was granted in 1650, adding to the town’s modest prosperity, and a successful trade developed in cloth, bark, corn and paper. In 1723 an educational trust was set up in the will of John Kelsick to start a school for boys. As the industrial revolution gathered pace across England, the canal system reached Kendal, linking it to Preston in Lancashire. The Napoleonic wars with their adverse effect on imports, had a major impact on wool production, with every inch of grazing land now valuable and walled. The canal provided the means to move wool and slate for roofing to the mills of Lancashire, and as the looms began to clatter across the valleys of northern England, a new woodland based industry also began for Ambleside and the southern Lake District. The forestry skills of the local people, developed over the centuries in the production of charcoal, were exploited to coppice hundreds of acres of woodland. These were ideally placed to supply the demand for millions of bobbins for the mills. Harnessing the motive power of that commodity which in the Lake District is never scarce, water, bark and bobbin mills sprang up along every riverside, giving birth also to machine tool manufacture, mainly in the form of lathes to turn the wood for bobbins. A thriving trade in carrying and carting also developed and at last the area’s road system evolved from muddy rutted tracks to reliable roads. Alongside Stock Beck, in Ambleside, as it rises towards the waterfalls in Stock Ghyll Park, are tall dark walls among the trees, in which you can see holes which used to support the axles of waterwheels. From North Road bridge, you look upon a replica of the wheel which once served the bark mill. Local bobbin manufacture declined towards the end of the 19th century, when cheaper sources were found elsewhere, but at the same time the gunpowder industry was growing, with the main local factory at Elterwater, supplying mines and quarries. The great textile mills of northern England produced new stratas of society. The mill owners, often from relatively humble but skilled origins, became enormously wealthy, the nouveau riche in fact. Ship owners too prospered as the colonies were exploited. At the same time, a new class of industrial workers developed, as poor country people migrated to the cities seeking employment. Both these new classes were to influence events in the area of Lake Windermere, which was still a remote and isolated part of England, and change its fortunes. 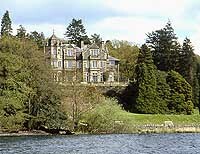 summer mansions on the shores of Windermere. These lavish forerunners of today’s more modest holiday home are dotted about for all to see. Many are now hotels or divided into apartments. The summer residences drew upon the local population for servants, gardeners and grooms, providing a new source of employment, the skills learnt there becoming of value in the slowly developing tourist trade. The French revolution had seriously scared the British upper classes, whose tradition it was to undertake the ‘Grand Tour’ of European classical archaeological sites. This became impossible during the Napoleonic wars, but coincided with the birth of English Romanticism in literature, epitomised in the work of William Wordsworth and the Lake poets. Wordsworth was the first writer to promote and extol the natural beauty of landscape. His vision was enthusiastically embraced by the educated classes as a partial substitute for the Grand Tour and Ambleside became a popular destination for those seeking to immerse themselves in this new romantic movement. As a result, by 1850 the area around Lake Windermere was gradually developing an increasingly important tourist trade, whose clients were wealthy and which although seasonal provided much needed income. 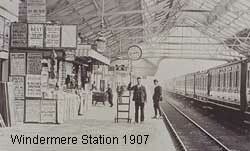 Local entrepreneurs naturally wanted to expand this trade and the coming of the railway to Windermere gave them their chance. What had previously been the ‘secret’ preserve of the wealthy and the educated was now becoming accessible to the working man, desperate to escape, if only for a day on Bank Holidays, from the grime and pollution of the mill towns to the clean air of the countryside, which he had left only a generation or two before. The demand for tourist facilities led to large scale development The present Victorian houses and shops in Lake Road, Compston Road, Church Street and Rothay Road were built at this time. Sir George Gilbert Scott was commissioned to build a new Parish Church, St Marys. This was completed in 1854 and its considerable size was an expression of the confidence felt at the time that prosperity was to continue to grow, and with it the population, which had more than doubled in the past 40 years. Drawing upon the sentiment of the Romantics, a movement among the wealthy visitors and newly rich owners of local land was started to prevent further expansion of the railways and thus curb the opening up of the valleys ‘to the vulgar gaze of the masses’. This led many years later to the formation of the National Trust, whose founder, Canon Rawnsley, lived in Grasmere at Allen Bank, the large private house which overlooks the lake from the north. Grasmere was in ancient times a more important parish than Ambleside, which had no church or consecrated burial ground. One of the most popular walks from Ambleside today is to Grasmere, using the old ‘coffin road’ which starts above Rydal Mount, Wordsworth’s home for many years. Although the preservation movement won notable victories, including the prevention of a railway extension to Grasmere, it was destined to lose the war against mass tourism. It stopped the railways, but it could not stop buses and cars and as car ownership grew in the post-war years, tourism became a major industry, coinciding with the creation of National Parks which today manage the landscape and control development. The old industries, in woodlands, mines and quarries, declined and the demand for domestic servants dwindled away after the first world war. Farming became increasingly mechanised and less profitable, and diversification into alternative industry was severely proscribed by development restriction. Today tourism and its controlled building development has become the only major area of enterprise and employment, which is an increasingly vexatious issue, yet to be resolved. From the earliest days of the conservation movement, local opinion was seldom sought or considered, the Lake District being perceived as a national asset for an educated elite rather than land from which its indigenous people needed to make a living. Thus began a conflict over the ‘soul’ of the Lake District, which has still not been resolved to many local people’s satisfaction. Many resent the artificial halt to normal economic evolution imposed by the National Parks Acts. Prosperity continued to grow, but due to its isolation, Ambleside was slow to develop modern standards of housing, public health and water supply. In 1855, the early feminist journalist Harriet Martineau made her home at the Knoll, Ambleside, and undertook various surveys of the local population. She found poor standards of nutrition, sanitation and housing among a majority of what was then termed the peasantry. Modern developments in electricity and mains water followed in time, but the Langdale Valley did not get mains electricity until the 1960s. Even now, the area lags behind the nation in TV, radio and mobile phone reception. Some of England’s more notable 19th century people made their homes in Ambleside and Grasmere, including Samuel Taylor Coleridge, Thomas de Quincey, Harriet Martineau, Dr Arnold of Rugby School and Beatrix Potter. 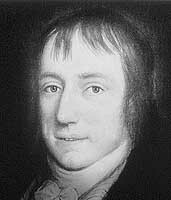 William Wordsworth was from Cockermouth, almost a local lad. Charlotte Mason founded her famous girls college with its new methods of teaching, moving into Scale How in 1894. This eventually evolved into the Charlotte Mason College of Education, now part of the University of Cumbria. The student population over the last century has contributed greatly to the town’s economy and to its favourable reputation in the outside world. The Bridge House, built as a folly in the grounds of what was Ambleside Hall, remnants of which are part of buildings in the area of the Golden Rule public house. The land now known as the pleasant Rothay Park was very marshy, along with most other low lying adjacent areas, until about 1890 when the land owner, a Colonel Rhodes, with the help of local labour channelled Stock Beck into its present walled course, then donated part of the drained area to the community. 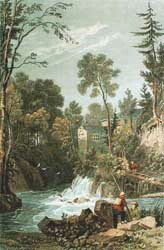 Colonel Rhodes also owned the land around and above Stockghyll Falls and took advantage of the tourist trade, offering donkey rides and bathing facilities at the waterfalls. There is a set of old photographs from this period on our Bygone Ambleside page. Among Harriet Martineau’s surveys was a Directory of the Lake District, a list of residents in 1855. The population has grown slightly since then to around 2500. The construction of the aqueduct from Thirlmere to Manchester in the 1880s brought an influx of Scottish workers, many of whom stayed on after the work was complete. Many Ambleside families joined the great emigration waves to the colonies and America, just as newcomers arrived to retire or to invest in tourism based businesses. Old Ambleside and Grasmere family names listed by Miss Martineau include Airey, Atkinson, Backhouse, Bell, Benson, Birkett, Coward, Creighton, Dawson, Dixon, Dugdale, Elleray, Fisher, Garside, Hardisty, Hayes, Hodgson, Horrax, Jackson, Jenkinson, Lancaster, Mackereth, Martin, Newby, Newton, Nicholson, Robinson, Shepherd, Slee, Thompson, Tyson, Walker, Wilson, Woodburn, Woodend and Woodhouse, almost all of whom have descendants still living in the district. Finally some extracts from Ambleside Parish Magazines of 1881. Ambleside History – a large collection of images and memories of town life in times gone by. Ambleside Oral History Group has interviewed many local people, spanning the years from 1880 to the present day, recording their memories of life and work. Their archive of interview transcripts is searchable online at www.aohg.org.uk, and also available at Ambleside Public Library.